Indian Prime Minister Narendra Modi approved the acquisition of four more maritime patrol aircraft last week. The Indian Navy is slated to induct four more Boeing Poseidon 8I Neptune advanced maritime patrol/anti-submarine warfare aircraft into its ranks within the next three years, The Economic Times reports. Last week, the Cabinet Committee on Security (CCS), headed by Indian Prime Minister Narendra Modi, approved the purchase of the four additional aircraft for an estimated total cost of $1 billion. “The contract will be inked with Boeing in the next few days,” a source within India’s Ministry of Defense said. “The first P-8I will be delivered to the Navy within three years,” he added. The defense ministry already announced in July 2015 that is has cleared $4.74 billion for new military hardware, including the four P-8Is. Approval by the CCS was the last step required before the signing of a sales contract could take place. As I reported elsewhere (See: “India and United States to Deepen Anti-Submarine Warfare Cooperation”), the news that the CCS has approved the purchase comes weeks after India and the United States agreed to deepen cooperation on anti-submarine warfare (ASW). I noted that the most likely area for Indo-U.S. ASW cooperation will be naval aviation. For example, during the 2015 iteration of the Malabar naval exercise both India and the United States dispatched one P-8I sub-hunting plane each. In January 2009, India became the first international customer for the P-8I aircraft, an export variant of the P-8A Poseidon, designed and built by Boeing to replace the U.S. Navy’s aging P-3 fleet, with the signing of a $2.1 billion contract for the purchase of eight planes. The first P-8I aircraft was delivered to India in May 2013. The Indian Navy inducted its first squadron of P-8I aircraft at Rajali Naval Air Station in southern India in November 2015 (See: “India Inducts First Squadron of Anti-Submarine Warfare Plane”). All eight planes are currently operational and have been inducted into the navy. “The P-8I is equipped with some of the most modern U.S. ASW technology including a Telephonics APS-143 OceanEye aft radar system and a cutting-edge magnetic anomaly detector,” I explained. 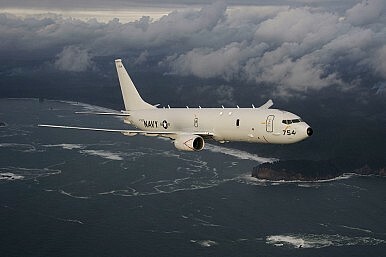 The APS-143 is not present on the original P-8A Poseidon in use by the U.S. Navy. “The aircraft is also armed with U.S. weapons systems including Harpoon Block-II missiles, MK-54 lightweight torpedoes, rockets, and Mark 82 depth charges,” I added. The aircraft are all data-linked with Indian submarines in order to have the capability to pass on information about enemy vessels. The Indian Navy has expressed growing concern over forays of Chinese conventional and nuclear submarines into the Indian Ocean.